increases in annual residential energy consumption of up to 32% by the end of the century. When petroleum costs began to rise and supply was threatened by the Iraq War, research into alternative energy was suddenly thrust into high gear after a few decades of relative inactivity. Just in the last 10 years, 70s era research was rediscovered and used to further our current interests in alternative energy. It’s time for landscape planners and landscape architects to re-engage with our equivalent research – the 70s era “design with climate” research that was conducted as a response to the energy crisis of that time. Among the climate adaptation needs it could serve is residential energy consumption. 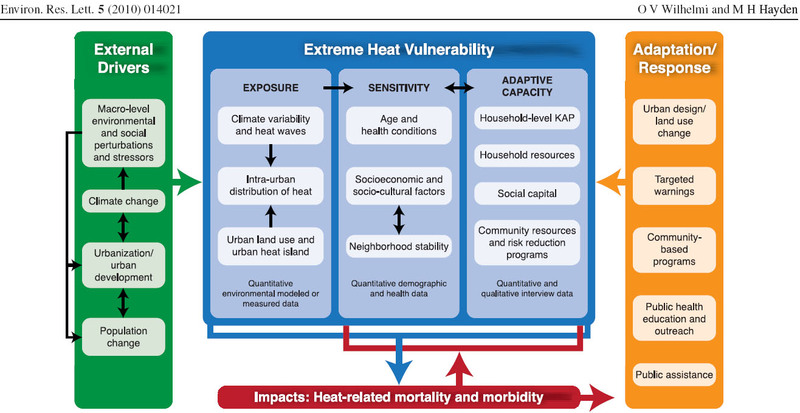 What can physical planners and designers do to help people, especially city-dwellers, adjust to a future of deadly heat waves? Designers already have the knowledge and skills to create comfortable outdoor spaces, but can heat-mitigating designs be ramped up to a scale necessary to save lives? How would we do this? What more do we need to know? All new research begins with a review of what we already know, and I have an initial summary of research literature for this topic. If this interests you, click here to read more. The diagram below (click on the image for a better view) is referenced in the link. And if you experienced a snowmageddon or snowpocalypse last winter, you might summon up that memory now as an escape from the high temps of July and August. If you have followed active living research over the past few years, you are very familiar with maps that track the incidence of obesity in this country. Today, Kevin Drum of Mother Jones calls this “the map of the day”. It looks very familiar, but the message is still appalling. These are rural Southern and Midwestern counties, for the most part, where obesity rates are high. 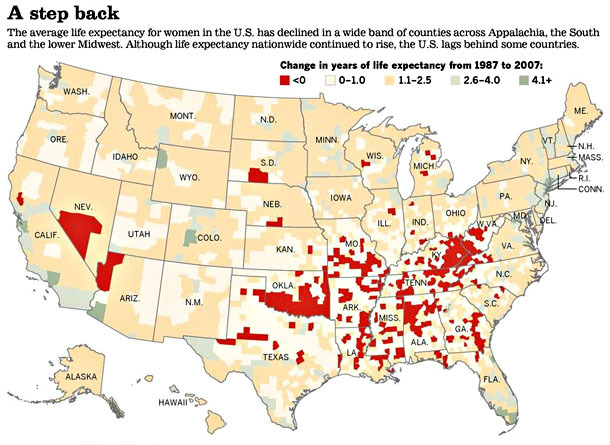 As stated in the Population Health Metrics article, decline of life expectancy in a developed nation is rare.